31st October 1517 was the day on which the Protestant Reformation began, as this was when a monk named Martin Luther nailed his “95 theses” to the door of the Schlosskirche in Wittenberg, which is between Berlin and Leipzig, Germany. Luther took exception to the method used by Pope Leo X to raise money for the completion of St Peter’s Basilica in Rome, namely the sale of indulgences to release the souls of the departed from Purgatory. The Pope encouraged agents throughout Europe to sell these pieces of paper to naïve and gullible people, in the belief that this would ensure that their loved ones would get to Heaven, and that they would also do so when their own time came. 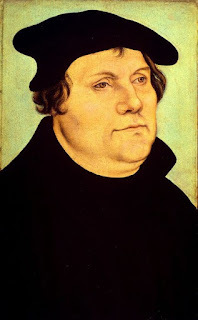 Luther was particularly incensed by the hard-sell methods used by Johann Tetzel, a German Dominican friar, who had been given the job by the Archbishop of Mainz. The 95 theses complained about many failings of the Catholic Church, which had been a corrupt organization for a very long time. Indeed, Geoffrey’s Chaucer’s Canterbury Tales, written in the late 14th century, included side-swipes at a number of questionable practices that were current then and which had not been put right before Luther’s dramatic gesture in 1517. Luther made sure that his complaints did not just stay on the church door at Wittenberg. Copies were sent to the Archbishop of Mainz and, thanks to the relatively recent invention of printing, they soon reached many parts of Europe. The hammer and nails used at Wittenberg threw off sparks that would light a powder keg under the whole rotten edifice of the medieval Catholic Church.